Pickling involves steeping foods in an acidic liquid, usually vinegar. This gives the pickled foods a distinctive flavor and helps to preserve them. If you don't like the flavor of vinegar or simply have an abundance of lemons, you can use lemon juice instead of vinegar for your pickling projects. Using lemon juice will give the final product a different flavor, however. If you appreciate the standard flavor of pickles, you might find that you do not enjoy pickles made in lemon juice. Sterilize your jar(s), ring(s) and lid(s). You can do this by boiling them in a large pot for at least 10 minutes. If your altitude is higher than 1,000 feet, boil the items for one additional minute per extra 1,000 feet. Wash the cucumbers thoroughly to remove any visible dirt or debris. Cut off a slice from the blossom end of each cucumber to help keep your pickles crisp. Fill the jar(s) with cucumbers. You can use whole cucumbers, cucumber slices or cucumber spears. 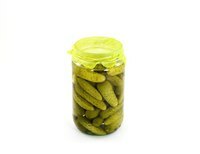 Fill the jars snugly with cucumbers but do not pack them in too tightly. Add garlic cloves, herbs or spices to the jars if you wish. Use one to two garlic cloves per jar of cucumbers and dill or other spices to taste. Put the lemon juice, water and salt in a saucepan and bring them to a boil over medium heat, stirring occasionally. Pour this mixture into the jars until it completely covers the cucumbers. Put a lid and ring on each jar. Process the jars in a water bath canner for 20 minutes. Allow the jars to cool, then check each one to ensure that is is sealed properly. Press the top of the jar; if the lid bends inward, the jar did not seal correctly and is not safe for storage.